Celebrating its 50 Year Anniversary, Long & Foster sought to honor the agents who serve the company and maintain its family feel. The book was to commemorate the company’s past while showing the forward progress of Long & Foster into the future. 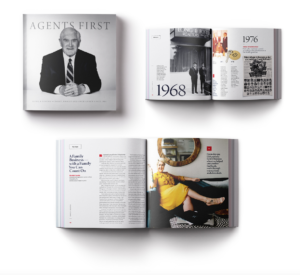 WCM’s editors and designers created a chronological layout with three major editorial themes: milestones by decade, agent profiles, and “save” stories, highlighting the business lines Long & Foster developed to serve its agents and their clients. Archival photos showcased the company’s key events and growth over the years. First-person profiles brought the agents’ voices to the forefront. A simple, sleek design using the company’s iconic colors and traditional fonts made the book feel familiar and contemporary. Washingtonian Custom Media / All right reserved.